Nevada is the fastest growing state in the nation with about 6,000 new residents every month and millions of visitors every year. Rapid growth means a commitment to real security is more important than ever. 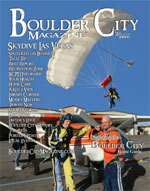 Homeland security starts at home in places like Boulder City. It starts with the local police, firefighters, and guardsmen who protect us every day. These first responders work hard for us and do an incredible job with not nearly enough resources. We must give them the support they need to detect and stop threats. That’s why I’ve fought so hard to get federal funding for security projects in Southern Nevada. I helped secure $200,000 for the Boulder City Wireless Communications Canopy so that first responders are better equipped to communicate with residents during an emergency. I secured $50 million in the Highway Bill for the Hoover Dam bypass. The bypass will include a four-lane bridge and connector roads that allow traffic to go around the dam. The bridge is necessary for our national security to protect the dam and ensure public safety, and will serve as a vital transportation link for goods and commodities. I also helped secure over $25 million for the Boulder City Bypass extension. These projects help provide what the people of Boulder City deservereal security. The highest responsibility of our government is to provide security for every American. We need policies that are tough and smart. That’s why my Democratic colleagues and I recently unveiled the Real Security agenda. It’s our comprehensive plan to strengthen and secure America, and to support our local first responders as they defend us. Under our plan, Democrats will implement 100% of the 9/11 Commission Recommendations, provide first responders and National Guard with the training, staffing, equipment, and technology they need, improve border security, and invest in the security of our ports and mass transit systems. I believe we should do this and much more. America is best protected, and freedom best advanced, by national security policies  including homeland security and energy policies  that are both tough and smart. There is nothing more important than protecting the safety of our families.